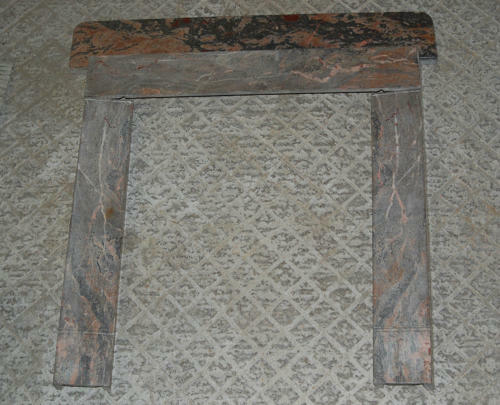 A pretty, reclaimed, marble fire surround with an unusual pink colouration. The petite surround would be perfect for a bedroom or small reception room and all pieces are present, ready for mounting to a wall. The marble has an unusual pink and red pattern on a grey background. The marbling is strong and is a striking and unusual design. The mantel is reclaimed and therefore has some slight signs of use and age. The marble has some scratches, marks and slight knocks and the marble will need cleaning by purchaser. There is a repaired crack to the mantel which will not be particuarly noticable when attached to the wall. There is a hairline crack to the crossbar but the stability of the fire is not affected. The fire surround has a fantastic classic style and its unusual colour makes the item very desireable. A surround that would add great character to a home.